The following is a reminder of the kind of people Sathya Sai Baba promoted and blessed as VIPs. He chose the most patently devoted i.e. 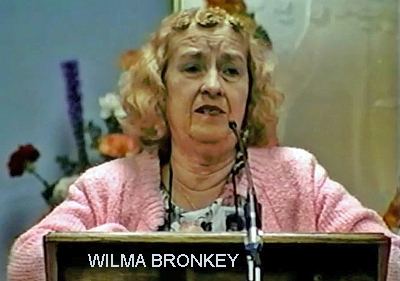 most gullible and pushy also the more unpleasant self-serving and self-important, such as Wilma Bronkey of Oregon, U.S.A. He manipulated them cleverly – boosting their already substantial egos – to help carry out his will in regimenting the top-down and totally undemocratic organisation. They earned his grace by obtaining major donors, to enforce unquestioning acceptance of anything he did, said or caused. They had to spread the false propaganda he and the ashram put out about him and to cover up any and every untoward and criminal event that could reflect on him or expose his actual behaviour behind closed doors (the world knows what the main untoward activity was). One example, my wife and I met a young lady and her American husband (I’ll call her M.) who were at Prashanthi Nilayam with their son of two years of age for the first time in February 1998. They informed us that they were being harassed by the leader of the group they had joined led by Wilma Bronkey – the woman from Oregon with Swami’s robe and all the vibhuti etc. which supposedly manifested at her house in some quantity. Bronkey had told persons in the group that the two-year-old son of M and her husband had demonic forces around him. They only learned of this from the others. Bronkey claimed to receive “messages” from Swami for devotees she accompanied to the ashram and in her group back in the US. She also said things about them that she held they did not know themselves, all due to her psychic powers of “knowing” and “seeing”. She also insisted that the group had to stay outside the ashram in an expensive hotel that was so far away that they had to take a rickshaw to darshan. They were also forbidden to eat in the ashram! She claimed that she received “messages” from Swami for people. When the victimised family moved to Norway, they came to visit us a few times to learn about our discoveries about Sai Baba and the organisation first hand. With support from others, they had made formal complaints about Bronkey to the organisation and, as a result, she was finally excluded. Through the years Wilma Bronkey received two robes from Sai Baba, which were always on display at her house in Oregon, which was visited by many West Coast Sai devotees, not least to collect vibuthi and amrit which reportedly appeared there in quantities. A person called Randy Segal mailed me in 2008 saying he had just met her after he last heart attack (she later died in 2010), claiming she was a saint. (See the mail exchanges with Segal here). The devotees in denial who post about every other person also in denial praise her in many on-line outlets. The last we heard Wilma B. of Oregon whom you mentioned has not yet been able to create perfect peace in her own life… as she serves the severed parts of pigs to people in her home. She was the featured speaker at the Sai retreat held in Texas during Labor Day weakend 1999. At this conference attended by many hundreds of Sai devotees, she stated that Sai Baba insisted that it was time for her to travel and make presentations regarding him and his teachings. Don’t you think this is being a little hyprocritical?….she is to represent ssb who claims to be God Almighty Himself and the Ultimate Absolute. Remember, she has visited SSB over one hundred times. By the way, have you listened to the cassette tape wherein she claims that SSB told her and made the prophecy that the whole world would now at this very time would be at peace!! PS. My comment to the above: Think how much money for return air fares for well over 100 visits to Sai Baba could have been used to improve the lives of others… rather than self-indulgent ‘holidays’ and attempts to promote and forward herself in the movement! I have never heard anything good about her, really – only that she has a massive ego and does not follow Sai’s teachings (as her non-vegetarian behaviour also exemplifies). One elderly Indian gentleman in her group who sat beside me once in the Prashanthi compound agreed she was very authoritarian. As to the prediction mentioned about world peace – this is yet another of the long list of failed predictions by Sai baba made to people like Kasturi, Peggy Mason, Connie Shaw, Rita and Robert Bruce etc. This entry was posted on April 15, 2016 at 11:08 am	and is filed under Sathya Sai Baba. Tagged: Wilma Bronkey. You can follow any responses to this entry through the RSS 2.0 feed. You can leave a response, or trackback from your own site.